Pacific Homecare provides home-based healthcare throughout the Auckland region to the disabled and the elderly community who wish to stay living at home, but who need assistance. With more than 20 years of experience serving the community, we strive to serve all clients with love, care and professionalism. Pacific Homecare was established in 1988 and was originally known as Kuki Airani Aorangi Pakari Trust. It was run by two women who answered a need for homecare services for the Pacific Island elderly people in the local Otara community. They raised funds by making and selling tivaivai (Cook Island bedspreads). The group grew as they responded to the demand of the diverse Pacific cultures, elderly and disabled in the Counties Manukau region. Provider affiliated to and funded by the Counties Manukau District Health Board (CMDHB), the Ministry of Health (MOH) and the Accident Compensation Corporation (ACC). In April 2011 Pacific Island Home Care Services Trust rebranded and changed our name to Pacific Homecare. Pacific Homecare is owned and governed by Pacific Islands Home Care Services Trust board and provides services primarily, but not exclusively, for Pacific people. We employ just under 200 staff to service a client base of over 600. If you would like to join our team, you can find our current vacancies listed on our careers page. Louisa is a New Zealander of Samoan descent. She is the current Manager of Pacific Health for the Heart Foundation. Louisa has extensive experience in the health sector in senior leadership roles with the Auckland District Health Board, Counties Manukau District Health Board and the Health Funding Authority. Louisa began her career as a general nurse and worked for 14 years in the USA as a registered nurse in trauma, intensive and coronary care units. Louisa has a passion for Pacific health, along with expert and personal knowledge of Pacific people and community, their values and cultural practices in the health sector. She loves being part of the Pacific Homecare family where she can contribute to ensuring Pacific people live quality lives. 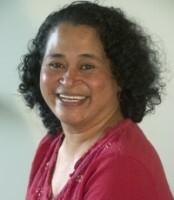 Caren is a proud Cook Islands Maori, whose families hail from the islands of Manihiki, Rakahanga, Rarotonga and Aitutaki. She is a qualified chartered accountant and auditor and runs her own consulting company. Caren lives in Napier with her partner McKenzie and their two young children, Mika and Kaiata, where much of their time is spent as active members of the Hawke’s Bay Cook Islands Community. Caren brings with her years of community, business and governance experience. She is the current Chair of Pacific Business Trust, a board member on the Broadcasting Commission (NZonAir), the Eastern & Central Community Trust, the Charities Commission Registration Board and is Chair of the Commonwealth Study Conferences New Zealand Trust. Known as Mama Pi to everyone, Pi Elisaia is one of the original Trustees and volunteers that started Pacific Homecare in 1988 as Kuki Airani Aronga Pakari Trust. Mama Pi was a nurse before coming to New Zealand from the Cook Islands. Along with Mama Matelena George (another co-founder) they were able to start the organisation to assist the Cook Island and Pacific elderly in the community, later developing further services for the disabled. Mama Pi took on the leadership of Pacific Homecare in the early years before fulfilling other leadership roles within Pacific Homecare as a Service Coordinator. She brings a wealth of knowledge and experience to the Board in understanding the client base and communities Pacific Homecare works in, as well as the relevant issues when delivering effective services to a strong Pacific client base, as she knows most of the workers and clients over the many years. Annette is New Zealand born with ancestral links to Samoa, the Cook Islands, the United Kingdom and a number of European countries. In September 2002, Annette established Le Anuanua Consultancy Ltd and after thirteen successful years of operating the business was wound up. Annette is a trained primary school teacher and was a transitional education tutor at Whitireia New Zealand for several years, before moving on to a pivotal role with New Zealand Qualifications Authority in 1994 as part of a team of 30, project managing and facilitating the development of the National Qualifications Framework. In 1997 Annette was employed as a Senior Policy Analyst [Pacific Education] with the Ministry of Pacific Island Affairs and went on to be seconded as the Private Secretary Pacific Island Affairs to the Minister of Pacific Island Affairs, Hon Vui Mark Gosche in May 2000. Annette has had a variety of consultancy work ranging from working closely with Pacific education providers in relation to strengthening their internal governance structures to reviewing the delivery of their education programmes. She has also undertaken evaluations, research projects, provider development facilitation and training across a number of sectors including being part of a team that delivered Quality Assurance training for the Adult and Community Education [ACE] sector. Annette has had governance experience at various levels for both public and private organizations. As well as her role on the Pacific Homecare Board, she is a current member of Victoria University of Wellington’s Vice Chancellor’s Komiti Pasifika; Whitireia New Zealand’s BAppA Combined Advisory Committee; and the Pacific Education Centre Board. Other work undertaken with Government Agencies, Crown Owned Entities and private organisations over the past fifteen years, has provided Annette with opportunities to work closely alongside community groups, schools, teachers, managers, artists, publishers, researchers, educationalists, academics and many others. This work had contributed to research and ongoing development and promotion of community resources, Pasifika languages curricular and guidelines for teaching and learning, and multi-media Pasifika resources for second language acquisition. 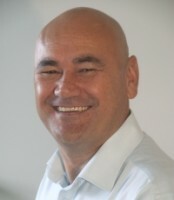 Hamish is the current Chief Executive of Pacific Homecare, having been in the role since 2010. He started out his career as a qualified accountant with a Bachelor of Commerce degree from Otago University and has an MBA in Economic Development from Eastern University in Philadelphia, USA. He has worked in the private, community, and public sectors over the last 27 years, having previously held Trustee roles with several community-based initiatives. He is an active member of TelstraClear Pacific Arena Board in Manukau and is involved in the recovery of the Cook Islands Maori Language Project. Hamish has a passion for community and economic development work in relation to Pacific communities, possessing a broad set of skills and experience to complement his specialties. Ann-Louise has been with Pacific Homecare since 2006, initially as a Support Worker, then a Service Coordinator before being promoted to Service and Training Manager in 2011. After completing her comprehensive Nursing Diploma at Manukau Institute of Technology in 1990, she has worked in hospitals and rest homes before starting with Pacific Homecare. Louise was born in Nauru, and is of Tuvalu descent, coming to New Zealand at a young age for education at Wanganui Girls Collegiate. She and her Tongan husband are proud parents to their six children. Louise is passionate about the care for elderly and disabled, and loves the training environment to empower Pacific Homecare staff with better knowledge and skills when working with clients. I really needed assistance. If you are half blind, a simple task like cutting your finger nails becomes very hard. That is why I am so thankful that I was able to get help from Pacific Homecare.They have set these principles like love, care and professionalism and my support workers implement them and put them all into practice. I really like that.